The Nokia Lumia 730 and 735: two handsets with one key difference? 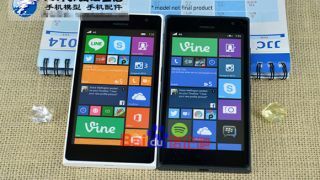 We're anticipating that Microsoft will debut both the Nokia Lumia 730 and the Nokia Lumia 830 at IFA 2014 this September, and the latest photo leak has provided some new clues regarding one of these devices. The photos appeared on Chinese site Baidu Tieba with watermarks claiming that they show not just the Lumia 730, but also a new Lumia 735 variant. The Lumia 735 is reportedly the version with 4G LTE, while the 730 has dual-SIM 3G capabilities. They appear here in black and white, though the release versions will likely come in more colors. As a successor to the Nokia Lumia 720, the Lumia 730 and 735 should fall in the mid-range of Microsoft's Windows Phone 8 handsets this generation. As Windows Phone Central points out, these photos make it look basically like a mix between the Lumia 720 and the Lumia 800/900 series in terms of design. The Lumia 730 is rumored to carry a 4.7-inch HD ClearBlack display, a quad-core Snapdragon chip, 1GB of memory, 6.7- and 5-megapixel cameras, and 8GB of storage with microSD support - and unlike other Lumia devices, no dedicated hard camera button. Not the greatest specs, but that's why the term "mid-range" exists.